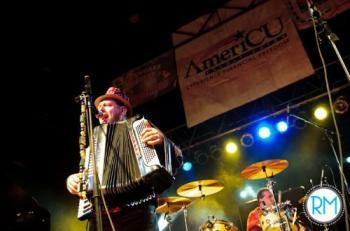 Fritz's Polka Band rips through a tune at First Night CNY on December 31, 2011 in Liverpool, NY. Photo courtesy of Ryan MacCammon. 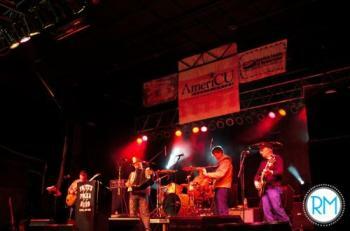 Gabe is pictured here during FPB's gig at First Night CNY on December 31st. Photo courtesy of Ryan MacCammon. 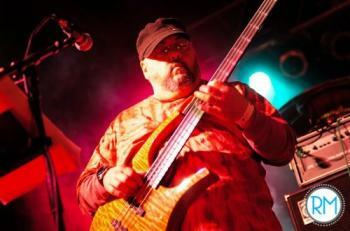 Fritz and Mike are pictured here during FPB's First Night CNY gig on December 31st. Photo courtesy of Ryan MacCammon. Mike is shown here under the red stage lights during FPB's gig at First Night CNY on December 31st. Gabe poses in front of his bass guitar rig on December 31st during FPB's First Night CNY gig. Smoke rises from behind FPB's stage gear in anticipation of their performance at First Night CNY on December 31st. 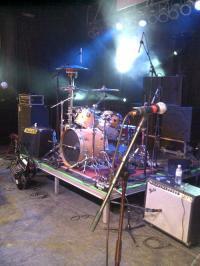 For this gig, the bass rig and guitar rigs were on opposite sides of the stage, compared to how FPB normally sets up. A crowded stage, as FPB along with members of their families and Gracie (FPB Fan Club Member) sing 'Silent Night' to bring the 2011 FPB Fan Club Holiday Party to a close, during the evening of December 10, 2011. Fritz, Gabe, and Rocko (special guest) rock out as Gabe plays lead guitar during the 2011 FPB Fan Club Holiday Party. It's Jager time at the 2011 FPB Fan Club Holiday Party in Verona, NY! Tom decides to test out Mikey's drum kit during the 2011 FPB Fan Club Holiday Party! Fritz and Mike are pictured here during their evening gig on December 10th at the FPB Fan Club Holiday Party. FPB and special guest, Rocko Dorsey jam on a tune during the FPB Fan Club Holiday Party the evening of December 10th. Rocko jammed with FPB during most of this gig. Tom and Fritz are pictured here during the 2011 FPB Fan Club Holiday Party in Verona, NY. Gabe is all smiles as he readies his Hofner bass for the FPB Fan Club Holiday Party the evening of December 10th. Mike is ready to get drumming for the FPB Fan Club Holiday Party in Verona, NY during the evening of December 10, 2011.